Living Legends completed plantings in two locations in the Bay of Plenty – one in Tauranga and one in Rotorua. 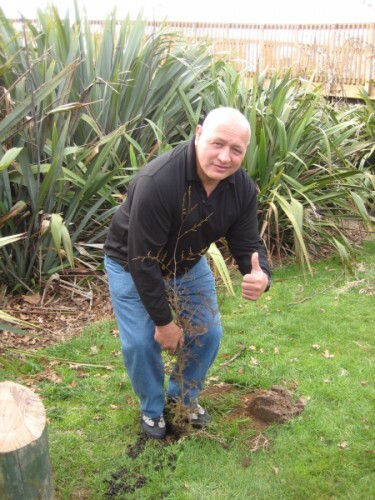 With the help of our volunteers and Rugby Legend Hika Reid, we planted over 13,000 native trees at these two sites. Living Legends planted 5,130 native trees at Hamurana Springs Recreation Reserve – famous for its beautiful crystal clear fresh water springs that emanate from the ground and flow downstream into Lake Rotorua. The surrounding wildlife sanctuary plays host to many species of birds including black teal, scaup, herons and the endangered dabchick. Hamurana residents and members of the wider Rotorua community have a long association with Hamurana Springs Recreation Reserve. In 2004, management of the reserve reverted to the Department of Conservation who has been undertaking weed control and revegetation works since. The local community and tangata whenua have been involved in community working days. Living Legends is proud to have been able to bolster their effects through the planting of over 5,000 natives over the last three years. 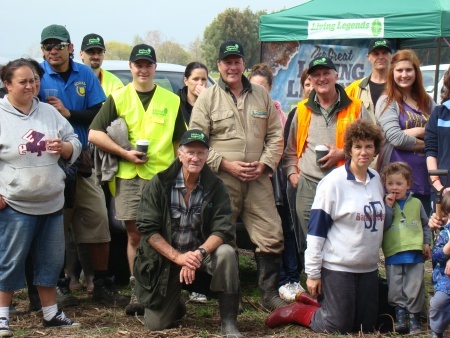 Living Legends planted a total of 8000 native trees at our Tauranga planting site, the Kaituna Wetland in 2011 and 2012. The Kaituna Wetland is a very significant conservation initiative in the Bay of Plenty with wide community support. It’s a wonderful reminder of how things once were. Cabbage trees and flaxes are flourishing, pukeko prowl through the raupo, numerous ducks, shags and pied stilts forage for food in the waterways. Only 3% of the Bay of Plenty’s original wetlands remain, so protecting and restoring what remains is priority work for the Department of Conservation, other environmental agencies and community conservation groups. The Living Legends plantings will help to enhance the largest remaining stand of kahikatea trees within the Reserve. These kahikatea are a seed source for the future, carrying the legacy of mature swamp forest that would have covered this area long ago. The Kaituna site has been outstanding for both growth and survival with cabbage trees less than two years old up to 2m tall. The objective of closing the edge around the kahikatea stand is now well underway with planting on the site complete. Living Legends will continue to oversee the maintenance of these planting projects in conjunction with the Department of Conservation, who will care for it for years to come. Ngongotaha’s Hika Reid is our Bay of Plenty Rugby Legend. This honours Hika’s tremendous rugby career, following on from the legacy of his own grandfather, J Hikatarewa, who represented New Zealand Maori in Australia and New Zealand in 1913. But it doesn’t stop there, Hika says his whole extended family were involved in rugby in some way. Rugby has been a lifelong passion for Hika, his earliest memories of playing on a dirt field at the local marae, at about five years old. At that early age, Hika wasn’t to know that his greatest dream would come true – to pull on the All Black jersey 17 years later. Hika was born and bred in Rotorua, attending Ngongotaha Primary School, Kaitao Intermediate and Western Heights High School where he was part of the 1st XV from 1973-77 alongside another of Living Legends named Rugby Legends, Buck Shelford. He then entered the Bay of Plenty representative side as a 20-year old in 1978 and until the 1987 season played 85 games for the union. Hika was selected to tour Australia with the All Blacks as an unknown 22-year old in 1980, owing his selection in part to the unavailability of the then test incumbent, Andy Dalton. Reid proved a major success. Though Dalton returned for the Wales tour later in 1980, Hika had by then proved his worth and was also named in the touring party, going on to be the preferred choice for the one-off international. From 1981 through to 1985 Hika served as Dalton’s understudy in test series against South Africa, Australia, the British Lions and England at home and on the tours of France (1981) and again to Australia in 1984. He was also in the first Seven’s team to Hong Kong in 1983, playing alongside the now Seven’s guru Gordon Tietjens. However, Dalton’s unavailability for the 1983 tour of Scotland and England and also for Argentina in 1985 meant Reid received his test chances then. He also replaced Sean Fitzpatrick for the last two tests of the 1986 series against the Wallabies. In all Hika played 40 matches for the All Blacks including nine tests. His last involvement with a national side was with New Zealand Maori on the 1987-88 tour of Europe and Argentina. Hika was twice a winner of the Tom French Cup for the season’s outstanding Maori player, in 1980 and 1983. His other national honours came with the New Zealand Colts in 1979, for the North Island in 1983-84 and in five All Blacks trials in 1981-82-83-85-87. In later years Hika Reid spent many seasons playing and coaching overseas, including in Ireland. In 2003 he took up an appointment as rugby development officer for the Bay of Plenty Union.